Dr. Sahasrabuddhe has prepared and prosecuted patent applications in a wide range of electronic and computer technologies, including data networking, computer security, databases, electronic design automation (EDA), computer architecture and semiconductor devices. Dr. Sahasrabuddhe is a co-author of more than 30 research papers that have been published in leading peer-reviewed technical journals, including IEEE/ACM Transactions on Networking, IEEE/OSA Journal of Lightwave Technology, IEEE Journal on Selected Areas in Communications, IEEE Communications and IEEE Network. Dr. Sahasrabuddhe is an inventor on seven U.S. patents. Before joining Park, Vaughan, Fleming & Dowler LLP, Dr. Sahasrabuddhe held various technical positions at networking and telecom companies, including AT&T Inc. and Amber Networks Inc. (which was acquired by Nokia Corp. for $421 million). 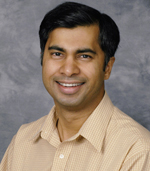 Dr. Sahasrabuddhe received the “Best Doctoral Dissertation Award” from the College of Engineering at UC Davis for his doctoral research in WDM (Wavelength Division Multiplexing) networks.